(formerly known as MCPELauncher). 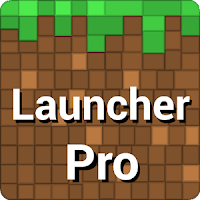 BlockLauncher Pro loads libminecraftpe.so from the currently installed copy of Minecraft PE, so it should be compatiable with the mod patching features of PocketTool and QuickPatch. THIS APPLICATION MAY NOT WORK ON ALL DEVICES! Please try the free version before buying this version to make sure that the app is compatible. ON JELLY BEAN, THIS APPLICATION CANNOT USE ORIGINAL MINECRAFT TEXTURES WITHOUT ROOT ACCESS! A built-in texture pack is provided for those without root.